Stricklandgate Methodist Church is located in Kendal. Our Membership is 165 with average Sunday Morning congregations of 75-80. 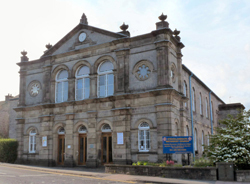 Stricklandgate Methodist Church is part of Christians Together in Kendal & District – a network of Christians in Kendal and the Kent Valley area of South Cumbria. It includes the Churches, charities and organizations to which they belong and the Ministries which serve them.